MANILA, Philippines (AP) -- The Philippines has canceled a permit for a South Korean company to build a spa on the crater of a restive volcano because of environmental violations at the site and concerns that the mountain could rumble to life, officials said. The spa's construction on the crater of the tiny Taal volcano, which lies in the middle of a scenic lake south of Manila, seemed like a good idea a few months ago, with locals hoping it would bring jobs and tourists. Environment Secretary Angelo Reyes said his department originally had issued a certificate confirming that the spa's engineering plan conformed with environmental regulations. But doubts soon clouded the project after scientists from the Philippine Institute of Volcanology and Seismology raised alarm, warning that the volcano, which has occasionally become active, was not safe. Taal, in Batangas province, has shown signs of restiveness since 2005. Two earthquakes jolted the island last month, causing no damage but focusing public attention on the perils of the little-known spa project. The small island where Taal lies has been declared a permanent danger zone, but thousands of villagers have settled there for decades, thriving on fishing and tourism. About 300 tourists visit the volcano island daily. There is corruption in the Philippines? Say it ain't so! As to the danger the volcano poses, its quite real. 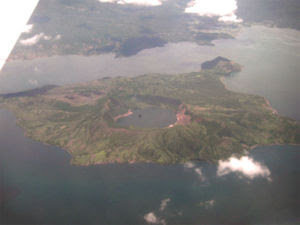 Taal, one of the country's 22 active volcanoes, has occasionally triggered seismic activity and geysers, and erupted mildly in 1977, causing no casualties or damage. A strong eruption in 1965 killed about 200 people. That would seem too recent and too regular a history of erruptions for allowing any business to be created in Taal's crater. Is this South Korean business nuts? A volcano doesn't need to erupt to cause havoc. Earthquakes and the release of gases(Sulphur dioxide?) before an actual eruption could take lives. These won't necessarily come with any warning either.